eGame (short for (Portabl)E Game Launcher) is a utility for launching games and allows you to keep an easy and searchable list of games. 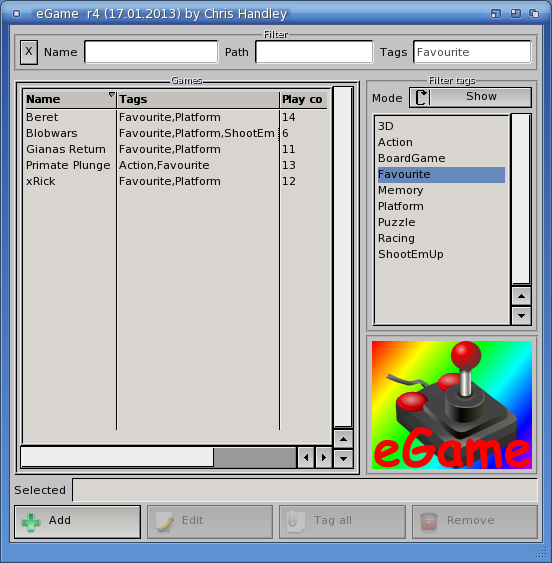 The gamelist supports tagging and filtering. It has an installer, supports screenshots and has many more features. This release adds some really nice features. For instance it is now possible to add disk images and 'foreign' executables that are automatically loaded by the appropiate emulator. The launcher supports Amiga (floppy disks), Atari ST, Atari Lynx, Megadrive, NeoGeo, NES, SNES, C64, Spectrum, Infocom & TADS (text adventures), and Megazeux out of the box. And if that isn't enough, you can configure your own launcher as well. For more information about changes in this release please read the history.